So proud to announce that I have been interviewed by Jordan Nugent from Mission Hot Mama. Mission Hot Mama is the brainchild of founder Jenni Hogan and is a place where moms can all help each other know it’s ok to spend some time on you and that you will be happier with your baby if you’re feeling amazing. With a host of amazing contributors, the Mission Hot Mama Club is a must. Sign-up here. 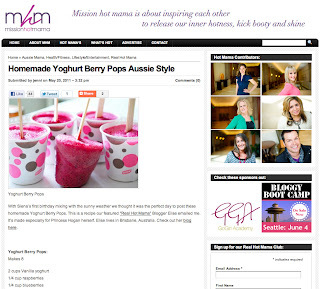 Check out the entire interview and my recipe for Homemade Yoghurt Berry Pops here.